‘Neerja’ is a biopic and a cinematic representation of the dramatic events that unfolded on September 5th, 1986 when Pan Am Flight 73 from Bombay to New York was hijacked in transit at Jinnah International Airport in Karachi by Palestinian extremists from Abu Nidal’s terrorist outfit. This is the story of Neerja Bhanot, a 22 year old part time model, who was the head purser on the flight. Neerja had escaped an abusive marriage at a very young age and as a life change, decided to become an air hostess, subsequently impressing everyone so much that they made her a purser. Throughout the horrifying situation, Neerja didn’t succumb to her fears and instead she fought her personal demons from the past and from the minute the plane was hijacked, through the terrifying 17 hours to the grueling end, she used her courage, wits and compassion to make sure that the passengers were protected, going as far as to hiding the passports of the American passengers. Through her swift thinking and brave actions, she managed to save the lives of 359 passengers and crew on board out of 379, all at the cost of her own life. Neerja was hailed internationally as ‘the heroine of the hijack’ and posthumously became the youngest recipient of India’s highest civilian honor for bravery, the Ashoka Chakra, and was bestowed the Flight Safety Foundation Heroism award by the United States, Tamgha–e-Insaaniyat (awarded for showing incredible human kindness) by Pakistan, Justice for Crimes Award by United States Attorney’s office for the District of Columbia, Special Courage Award by the U.S. government and the Indian Civil Aviation Ministry’s Award. 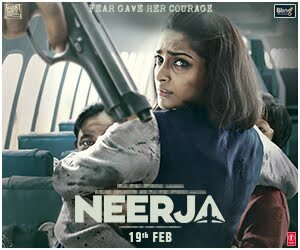 This is a portrayal of Neerja’s strength, courage and sacrifice and an attempt to bring before the world this lesser known Indian hero’s story, so that she becomes an example and inspiration to young girls all over for generations to come.